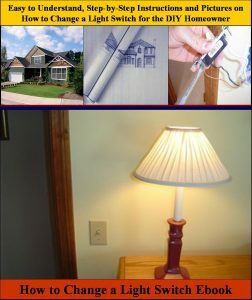 If your old light switch is no longer working properly, or you just want to change the style of your existing light switch, this Ebook will walk you through the process of changing a light switch. The “How to Change a Light Switch” Ebook provides easy to understand, step-by-step instructions, on how to replace a Light Switch. Pictures are included for every key step in the process! Order Now and Immediately Download the How to Change a Light Switch EBook today! The How to Change a Light Switch EBook costs only $11 and is 100% guaranteed. About the Author: Mark Donovan was a contributing writer to the Weirs Times, a state wide newspaper in New Hampshire. He has also written hundreds of articles on home improvement projects, and his Vacation Home Project was featured on the DIY Network’s Be Your Own Contractor Vacation Home Series in 2005. Over the past 25+ years Mark Donovan has been involved with building homes and home additions. His projects have included: building a vacation home, building additions and garages on to existing homes, and finishing unfinished homes. If you are unsatisfied with this EBook email us and we will issue you a complete refund.